Clinical Decision Support is an HIT function that allows users to use general and person-specific information to enhance health and health care. Clinical Decision Support rules, or CDS Rules, are created under the Patient Lists feature of TRAKnet 3.0. Much like patient lists, CDS Rules are meant to search for patients who fit a certain set of criteria and encourage the members of the office to take action toward those patients that will help improve and better patient care. To access patient lists, click on the Reports drop-down menu in the upper-left portion of TRAKnet 3.0, then select Patient Lists. This will open the Clinical Decision Rules and Patient Lists screens, where there are two tabs available. Rules and Lists — This tab is where CDS Rules (and patient lists) are created. Reports — This tab is where CDS Rules, Patient Lists and Reminder Reports can be generated to create lists of patients based on the set criteria. To add a new CDS Rules, click on the Rules and Lists tab. Click on the CDS Rules header, and then click Add. NOTE: TRAKnet will come pre-loaded with several examples; however, a helpful rule thumb to keep in mind is that CDS Rules are essentially if-then statements. If a patient meets this criteria, then suggest this. There are three required portions to a CDS Rule: Name, Suggested Intervention, and Criteria. The Add CDS Rule window will then open. On this screen, you must first Name your new CDS Rule. This name should be brief but informative, explaining the ultimate goal of that CDS rule. One example in TRAKnet 3.0 is the "Suggest nail culture" CDS Rule. This name is brief but explains what the user should do in the event a patient meets this criteria. After naming your CDS Rule, you must then select your Suggested Intervention. This is the "Then" portion of the If-Then statement. Your suggested intervention must be either a Laboratory, a Medication, or a Problem, per CMS guidelines. Click the dropdown menu for which intervention you would like, then click Search to search for the specific lab, medication or problem. 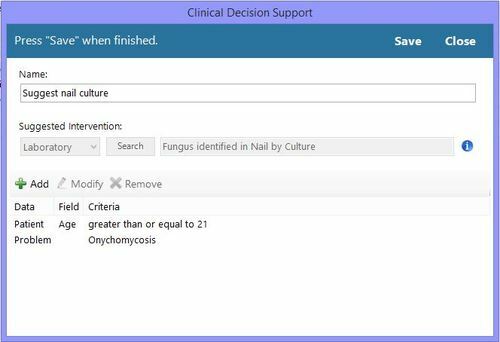 Our above example uses a Laboratory intervention of "Fungus identified in Nail by Culture." Patient — Patient specific demographic information such as age, gender, or ethnicity. Problem — Diagnoses, used to generate a list of patients who are diagnosed with a specific problem, such as a list of all diabetic patients. Medication — Used to generate a list of all patients with a history of a specific medication. Medication Allergy — Used to generate a list of all patients with a history of a specific medication allergy. Laboratory — Used to generate a list of all patients with a history of a certain lab. Vital Sign — Used to generate a list of patients based on height, weight or blood pressure. An image of our finished CDS can be viewed to the right of this text. Once CDS rules have been put into place, any patient who meets the above Criteria will have an alert on their chart. This alert will appear in a red box and be labelled CDS. Clicking the alert will open an Alerts screen where the suggested intervention can be viewed. Measure: Implement one clinical decision support rule. From any main screen in TRAKnet, click Reports at the top. Click Rules and Lists tab. Click Clinical Decision Rules and click Add.